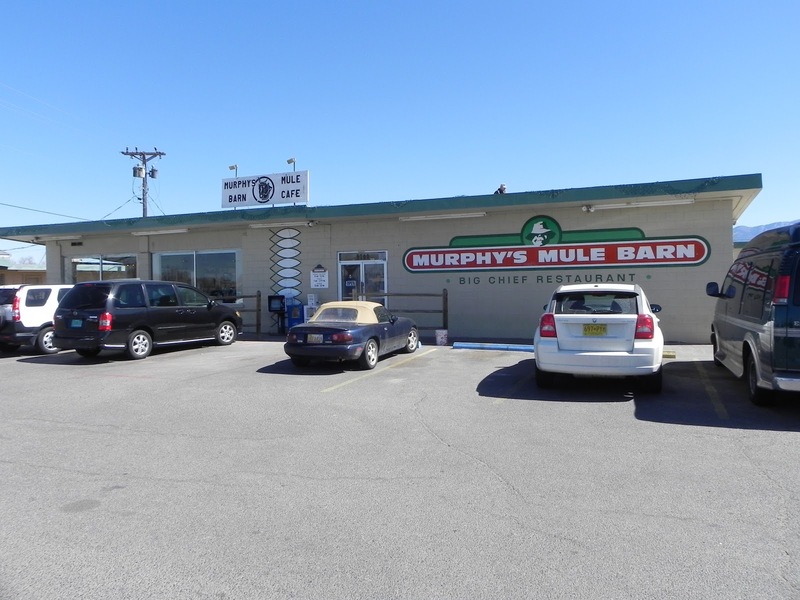 Some people may consider Murphy's Mule Barn, in northwest Albuquerque, a historic gathering place since it has been there forever. 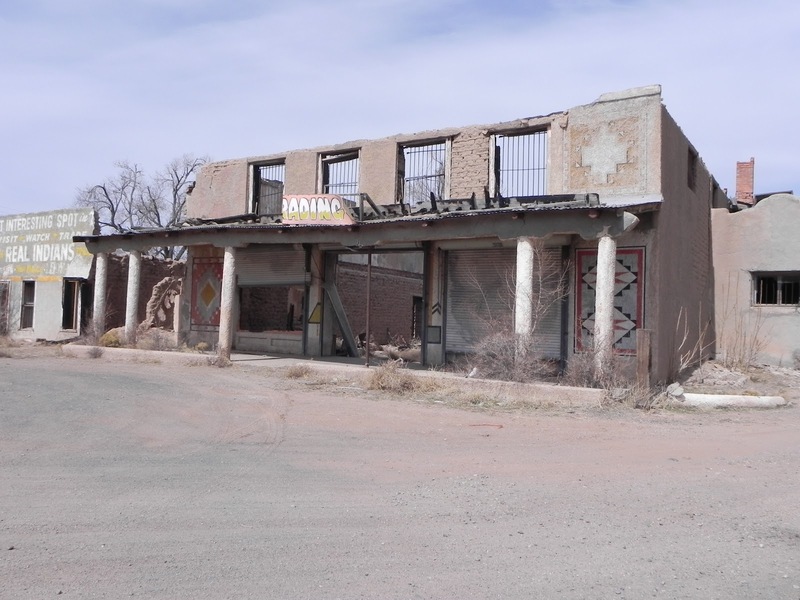 Originally a truck stop on Northwest 2nd Street, the fuel pumps were removed after I-25 was built a little bit to the east and truck traffic dwindled. 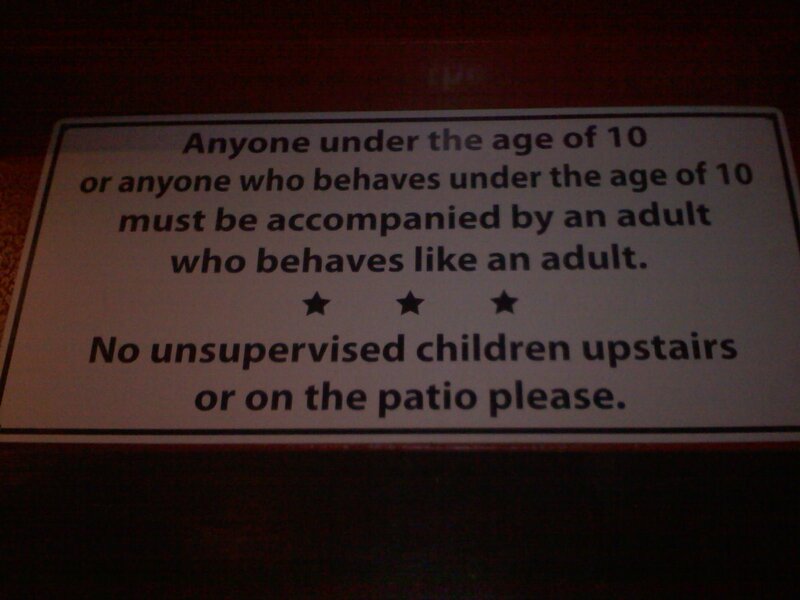 This happened in the late 1960s as I was informed by a longtime customer. 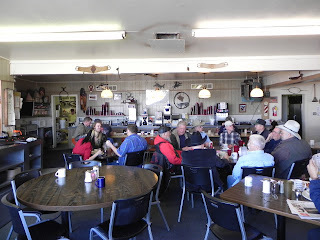 Inside there is a large round table where, again I was told, where everyday for the past 30 years sit a group of men who have breakfast and discuss the news, politics and happenings in Albuquerque and New Mexico. Judging by the cowboy hats of some and the clothing and appearance of others, it seems hard to think they are engaged in heavy duty conversation. 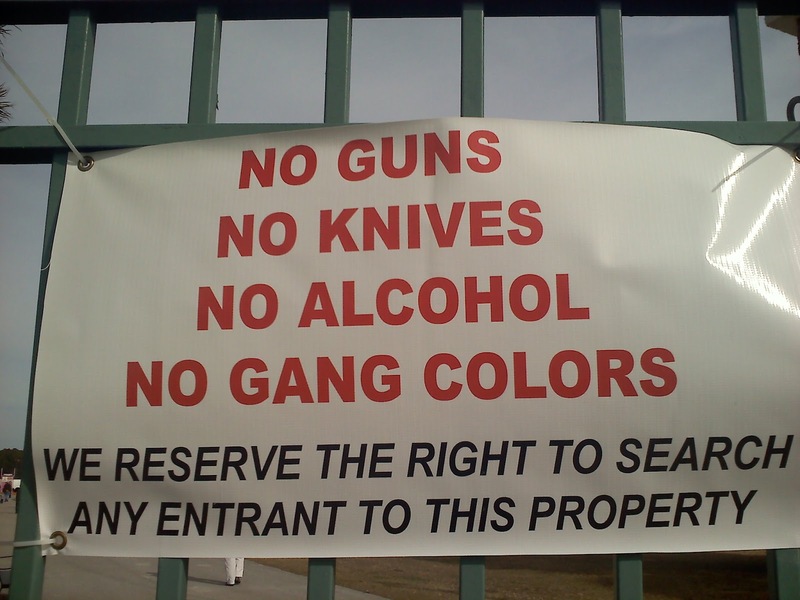 It just seems ironic but it goes along with the territory...no pun intended. There is even a plaque on the wall with their names and some blank spaces. You see, when one of the group dies, their name goes up on the plaque and a seat opens up for a new face. There is a long waiting list. 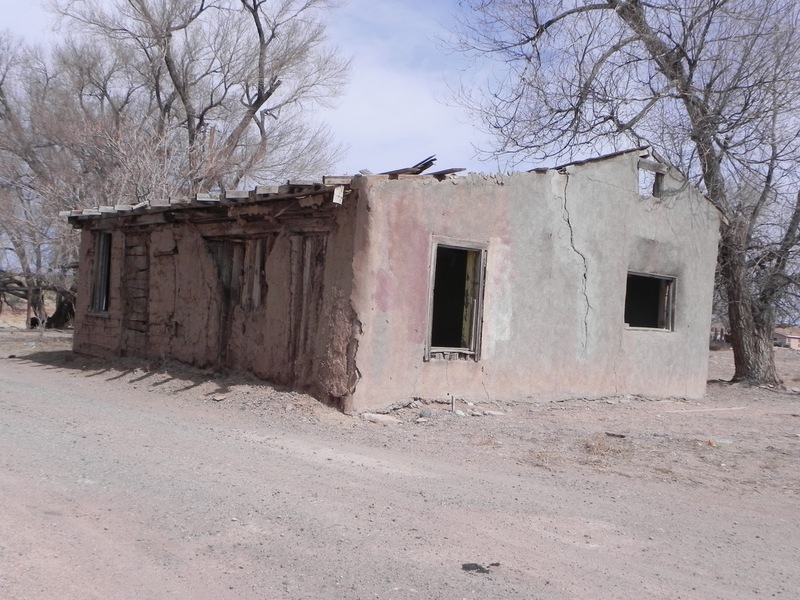 "The Kewa Pueblo Station (previously Santo Domingo Pueblo) is located near the ancient Cerrillos turquoise mines and its people have an entrenched history of making fine jewelry and heishi out of the colorful stones. The Kewa people historically are great traders of their crafts, very much like their Mesa Verde and Chaco Canyon ancestors." .....Courtesy New Mexico Railrunner Express. 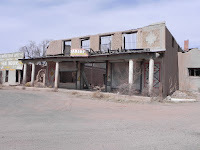 So I drive up I-25 to try to locate abandonded buildings that I saw from the Railrunner at the above mentioned location. 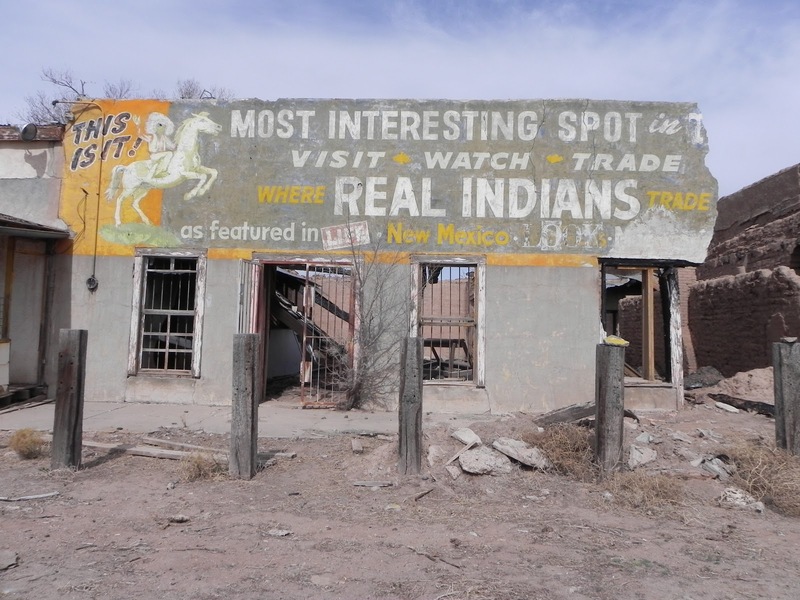 From today's Amtrak's Southwest Chief and the Santa Fe Super Chief of years ago, you would see this from the window of the train. Now, photography is strictly prohibited on the Reservation, since you are on sacred land and you could get in all sorts of trouble, especially being a "pale face". As I was taking these pictures, there was nobody around for miles. A very large explosive and rumble sound came from the East. Keeping in mind the US Air Force is always in the area, I thought perhaps a sonic boom, but it sounded different, but with the same effect: a strong gust of wind came up right after the exlposion and continued for several minutes. A higher power was watching me and was giving me a sign!!! Get the hell away!!! I got in my car and drove away only to see a Sandoval County Sheriff's Deputy passing me going to where I just was. Green or Red? And Do You Want Butter With The Tortilla?!?! In previous postings I have stated that I have been to Mexico many times. 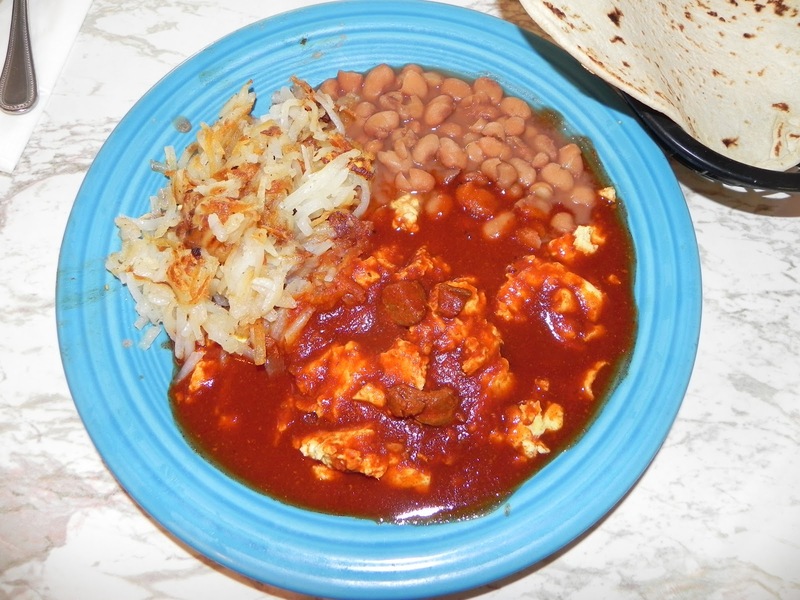 Last week, in New Mexico, I was shocked to have been asked if I would like butter with my tortillas!! BUTTER?? If I was in Mexico, the Tortilla Police would have locked up both the restaurant owner and me for such a thing. While butter is rarely used in Mexico, it apparently is common to apply it to warm tortillas in New Mexico. What a surprise. 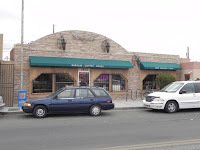 So I went for breakfast at Barelas Coffee House, a long established, very busy eatery in the Barelas neighborhood, south of downtown Albuquerque, "where everybody knows your name". and I was coughing all over the place. 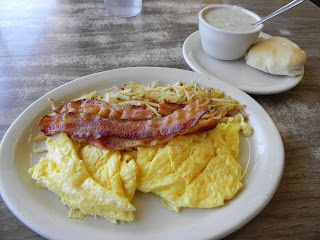 After giggles from the other tables and some remarks by other patrons, my system settled down and I was able to consume this breakfast delight and the buttered tortillas with no further issues. Really? 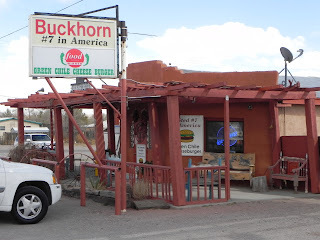 To drive 80 miles from Albuquerque to San Antonio (New Mexico, not Texas) for green chile cheeseburgers. Yes. Like the legendary rivalry between Geno's and Pat's Steaks in Philadelphia, are Manny's Buckhorn Tavern and The Owl Cafe, just down the road on this dot on the map; San Antonio. 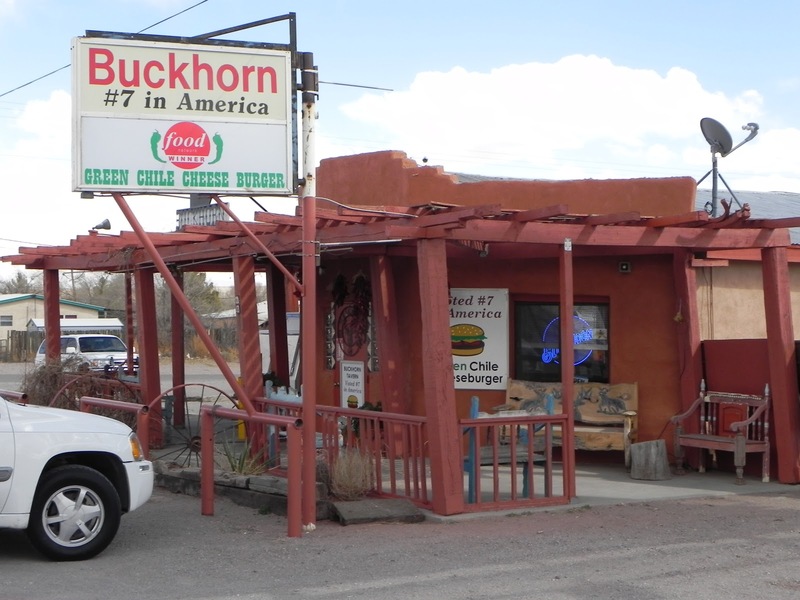 I decided on The Buckhorn since my experience with The Owl in Albuquerque was not good, and besides, Manny seemed like a good guy when I saw him with Bobby Flay on tv. He is a nice guy in person too. 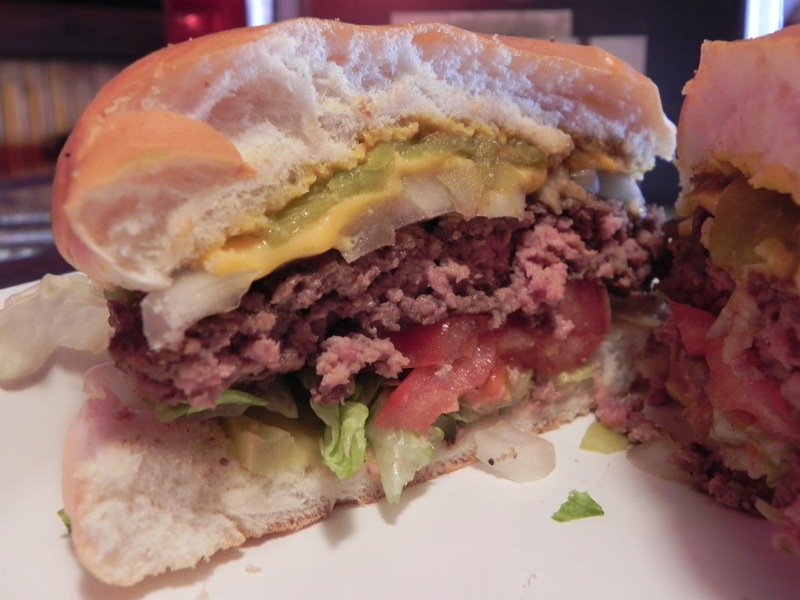 My decision was right and the burger was perfectly made for the roll, or bun, depending on where you're from. After a brief rest of consuming the first one, I ordered another only because I had to savor the moment of being there. 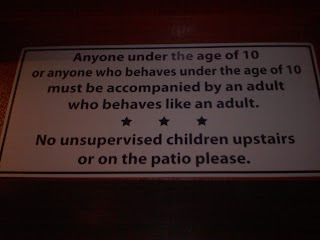 Besides, I didn't order onion rings or beer. Just iced tea. No ketchup here, that will ruin it. A little yellow mustard along with the lettuce, tomato, onion and cheese and Manny's green chile completed the sandwich. If there were any other secret ingredients, I did not know about them. And yes, if I did find out, I would have to be killed. 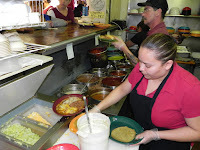 Returning north to Albuquerque, my stomach was happy! 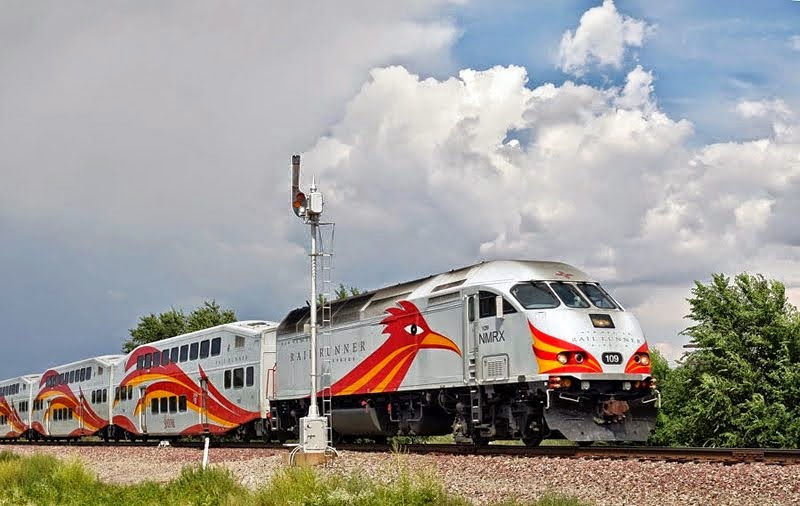 The Railrunner Express makes a great ride if you're yearning to go up to trendy Santa Fe for dinner. I boarded a late afternoon train for the 1 1/2 hour ride to Santa Fe to go to Backroad Pizza (featured on Diners, Drive Ins and Dives) sample their pizza and a brew from Santa Fe Brewing, then go across the street to 2nd Street Brewing Company for another beer or two. By this time I was feeling a buzz which is why I took the train in the first place. When I was done at 2nd Street Brewing, I walked the pedestrian / bike trail up to the train station, hopped on the train for the trip back to Albuquerque. 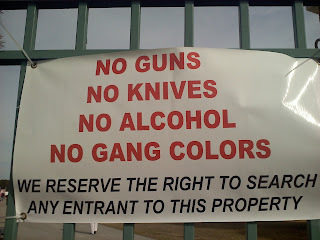 By the time I returned, I was fine to drive back to my hotel. The cost of the train ride includes a free transfer to a bus in Santa Fe. Backwoods Pizza is good by New Mexico standards and 2nd Street Brewing is good by the hop head standards for craft beer. 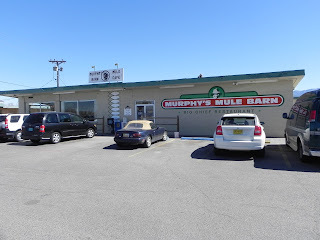 In a small town, far, far away in Bosque Farms, New Mexico, a rare place exists that is not part of the franchise galaxy. 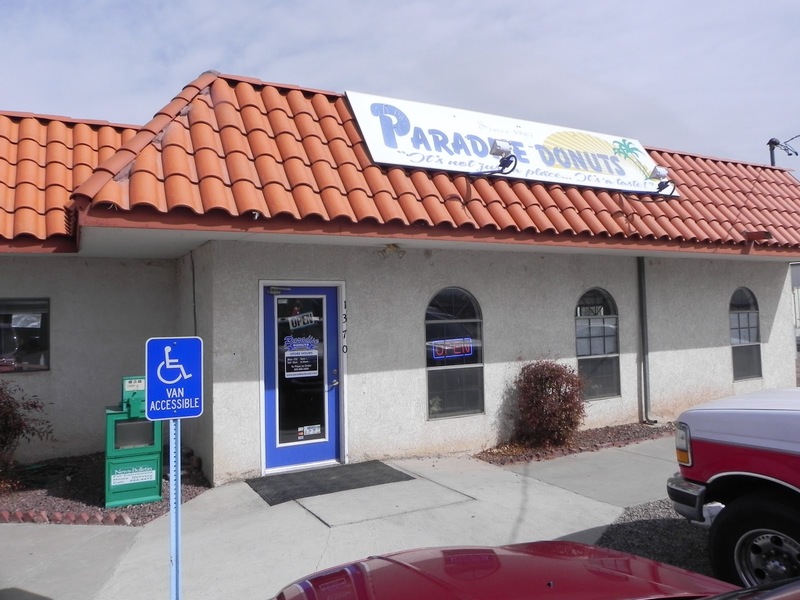 This store, Paradise Donuts, is the only outpost in New Mexico. 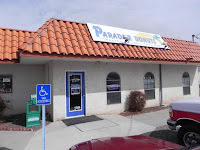 Eddy, the owner / licensee tells me Paradise Donuts is based in Catoosa, Oklahoma. Aren't those OKIE'S lucky they don't have to travel to Mexico for a taste of Paradise!! 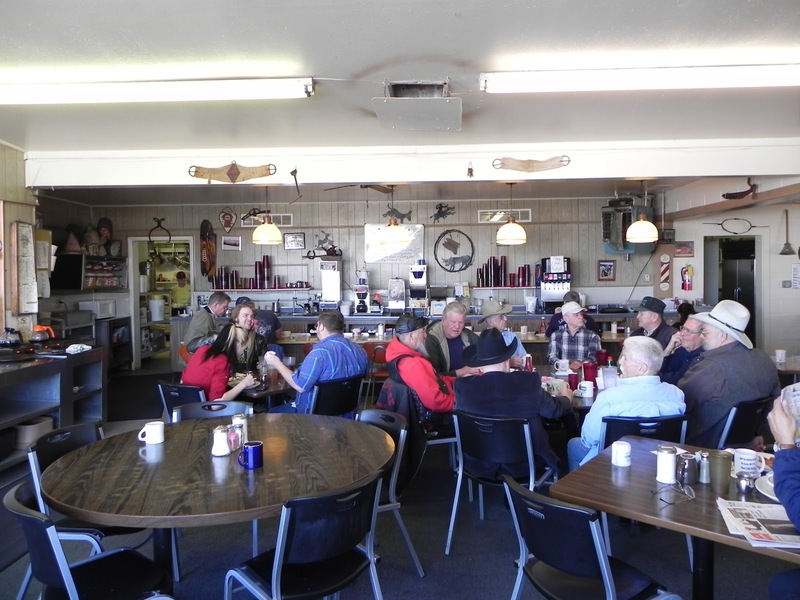 Eddy has been open since 1967 in Bosque Farms, which is about a half hour south of Albuquerque, and has a loyal following. 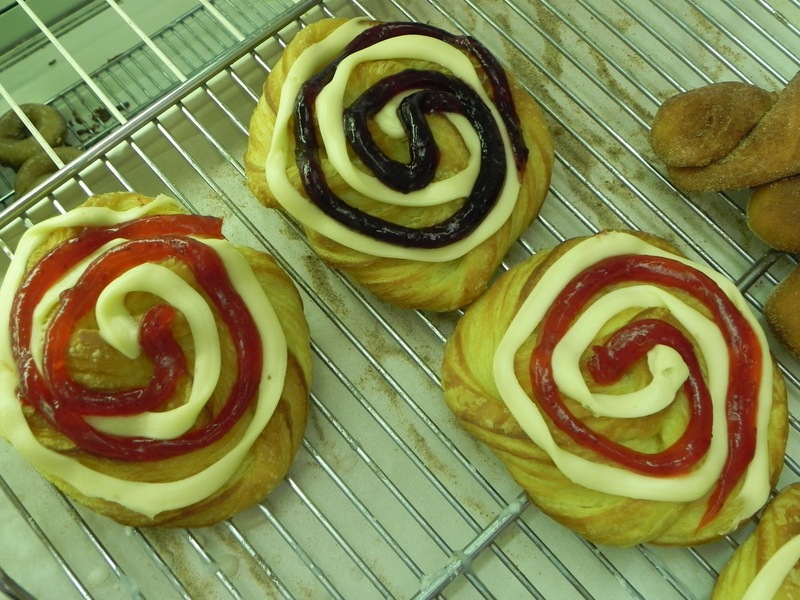 Eddy is not franchise owner but is a licensee, using the flour and other ingredients from corporate Paradise. The end product is heavenly baked goodness which after having a couple, you too will be in Paradise. Mom, Dad, George and Louis = Great! As the strong afternoon New Mexico sun shines on the side door of The Monte Carlo, I go inside to find a kitschy bar/kitchen/dining room of 1960's Las Vegas complete with deep red leatherette half round booths with dark wood. As I look around I notice all sorts of interesting collectibles ranging from two old soda machines, a gas station pump and numerous beer advertising memorabilia which I haven't even seen in flea markets. 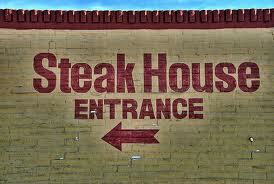 I was presented with a menu and quickly ordered the rib-eye with dinner salad, baked potato and garlic bread. After my order was placed, I see some guy walking around schmoozing with the customers. I waved him over, he sat down and we talked food as I ate my dinner. That guy turned out to be George Katsaros. George and his brother Louis, own this "world renowned" restaurant, thanks to Guy Fieri of the Food Network. George and Louis are the sons of Greek immigrants. 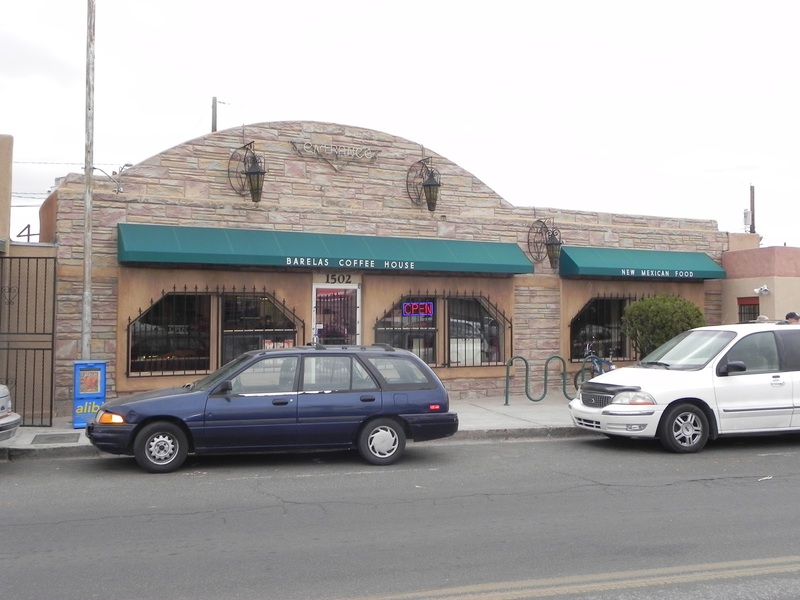 Being Greek, it is in their blood to be in the restaurant business. How they did not land in New Jersey, the Greek owned diner capital of the world is unknown. toy trucks, limited edition and rare liquor and soda bottles. Not only is the food here a feast for the mouth and stomach, it is also a feast for the eyes. I told George I would make mention of the ATM in the dining room, but I decided against it. 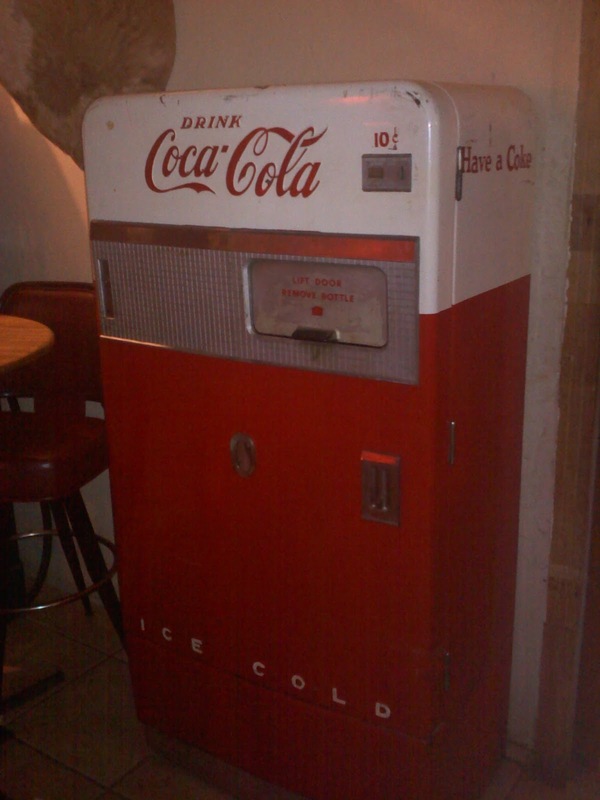 Instead, this is one of the soda machines on display.